Kelso Ram Sales We had a very successful day at Kelso with our Blue Texel Shearling Rams averaging £850 and our Lleyn Rams averaging £545. We also sold Blue Texel x Rouge Shearling Rams to £500. Blue Texel Society Sale at Worcester the three top priced animals sold were all sired by rams from the Millside Flock, firstly the Overall champion, a ram lamb from the Sams flock (A. Froggatt, Abbots Bromley, Staffordshire). This upstanding lamb was by a son of our Jonsland ram JOJ – 4701N and out of a ewe bred by Iwan Evans, and sold for the top price of the day, 1700gns., to Heather McCurdie (MAC flock) based at Birdingbury, Rugby . The next highest price was for the aged ram which was sold by Sarah Chambers from Devon (Shearstone flock) to Messrs. Watkins, Hereford for 1500gns. 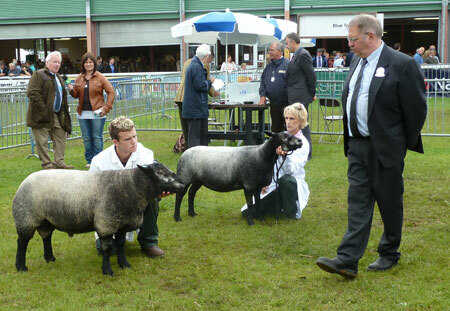 This 2011 Three Counties and Royal Welsh Show Champion was sired by a son of Craigalbert and out of a Millicomb ewe. 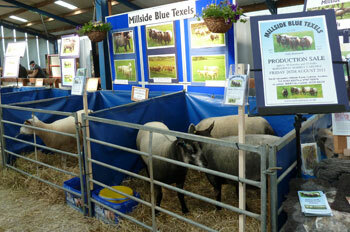 At the Royal Welsh Show 2011, spectators witnessed the best ever show of Blue Texel sheep seen at Builth Wells. 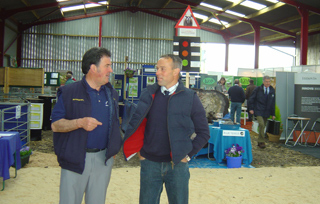 Classes were very well supported with a total entry of over 80 sheep and were ably judged by Mr Arfon Hughes. There was a tremendous interest around the ring both from present breeders and also from those thinking about becoming involved in the breed in the future. A two-shear ram owned by Sarah Chambers from Devon and bred by Wallace and Heather McCurdie of the Mac Flock won the Overall Championship. This superb ram was sired by a ram from the Millside Flock and out of a Millcomb ewe. The Female and Overall Reserve Champion at the show was a 2-shear ewe bred and owned by Dan and Janine Jones of the Jonsland Flock. Having previously taken the Overall Championship at the show in 2007 and again in 2010 they almost completed the hat trick. This classy ewe was sired by Jonsland Dan who was Champion as a Ram Lamb at the Royal Welsh in 2007 and was later purchased by the Millside Flock. Her dam, sired by the well known stock ram (Craigalbert) at Millside was purchased in 2008 and is out of one of the best ewes in the flock. "It's amazing who you can come across at events such as these!"